The Amazing Pets Show at Grand Country Music Hall is one of the most fascinating shows in Branson to watch during spring season. This one-of-a-kind show features exciting acts and tricks from a variety of skilled dogs and trained house-cats, a fantastic show that gives more fun to everyone. This pets show has an amazing troupe of furry critters who will captivate your hearts as they perform on stage giving you more fun and laughter. Many of the amazing animals have been rescued from dog pounds and humane societies across the country. This awesome show at Grand Country Music Hall is performed daily in the morning only at 10 o’clock. Amazing Pets Show features a variety of awesome animals including dogs, cats, exotic birds and many other magical surprises that will put a smile to audience. This upbeat two-hour show is a fast-paced entertainment offering lighthearted fun and exciting experience. All throughout the amazing show, you’ll witness a number of tricks performed by ringleader Sean’s cast of furry entertainers. The felines and canines that perform throughout the show including a group of exotic birds truly captivates the hearts of the audience. In this exciting pets show, you’ll also see an amazing performance by a counting donkey and even performing pigs. You’ll be amused also as cats hopping through hoops, dogs barking, and cats meowing and flying, they’re all ready to entertain everyone. This fast-faced show offers every audience incredible fun experience, so bring the whole family for this unique form of entertainment in Branson, Mo. 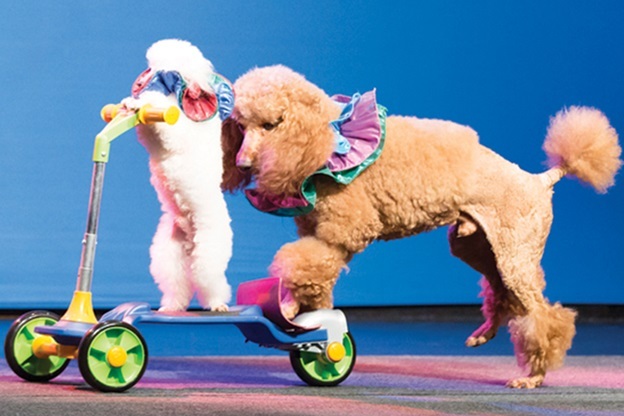 The Amazing Pets Show features more than 30 trained amazing animals that will perform on stage many different feats, including riding on a bicycle and scooter, walking on two paws, and even putting on a doggie fashion show. Kids and adults alike who love pets are sure to be delighted by the tricks and amusing performances of these amazing creatures. Most of these animals featured in the show are trained by Valery Tsoraev, a Russian-born dog and cat trainer. Valery Tsoraev have travelled around the world and performed along with the Cole Bros. and appeared in the “Big Fish” film in 2003. In this Amazing Pets Show, you will be entertained by the trained house cats perform a death-defying leaps like the one featured in “Big Fish’’ and a balancing act on high wires. A trained dog named Hercules also performs amazing magic tricks that can put audiences in great applause. The show also creates a big role with magic and comedy play that allows interaction segments with the audience where kids come up on stage and help pets perform some tricks. This fast-faced show keeps kids fully attentive to every segment that normally lasts 5 minutes. The show truly gives every audience a unique way of entertainment. So, if you want to take a fantastic vacation this spring break, visit the Amazing Pets Show at Grand Country Music Hall in Branson where you can see amazing pets in action performing tricks and acrobatic acts.